My flight left late on Thursday night from Frankfurt Hahn, my younger daughter brought me to the airport (thank you!). Arrival in Edinburgh was late, after 10 p.m., already dark, my rental car was not as expected to be picked up at the rental car center on the airport, but about a mile outside, I had to look for a shuttle bus to get me there. Fortunately, there still was one that late. It was almost half past 11 until I finally got my car, it was a little Nissan Mute, with GPS and automatic gear as ordered, perfect for my purposes. It’s just easier, not to need to switch gears with the unaccustomed left hand and getting slowly used to the strange car and driving on the left side of the road. Filled in the post code for the Youth Hotel in Edinburg and got started. Here’s my advice: Great Britain’s post code system is fabulous, consisting of digits and letters and that’s much more accurate than ours is. Of course, the GPS in the car can also work with city, street and house number, but a 6-7 digits code is so much faster to fill in and leads almost every time to the very building where I want to go to, not like ours just leading into a city or district. So, my dears, best is to find out the post code for all your sights, put them on a list and ready. Great! My car’s tank was empty and I needed a gas station first. Driving time into the city was about 30 minutes and so it was after midnight when I searched a parking near the Youth Hostel. It’s on a main street crossroad with no parking space of its own, there are only a few spaces along the road where I can leave my car until 8 in the morning. Ok, this will do, I want to leave early anyway. By the way, you always should let your hotel know that you’ll be that late, otherwise they might cancel your reservation. I chose a cheap option with a six-bed room because my night would be short anyway and I didn’t want to pay for an expensive room without really making use of it. There were 3 bunk beds inside and there was somebody already sleeping in the lower one by the window. Another bunk bed was occupied by some people’s stuff and I chose the lower bed of the free one since I didn’t want to sleep upside. Unfortunately, the women sleeping was lying in front of the half open window and it was getting colder through the night. I slept full dressed and still froze, not really some good sleep that night. I hadn’t really well rested when I got up first in the room, took a shower and an early breakfast to use as much of the day as possible. Breakfast in the hostel was as good and varied as in any other hotel, however, I’m not going to choose another six-bed room anymore. I checked my route for the day once more on breakfast, then I programmed my GPS and started driving carefully through the morning rush hour in Edinburgh. You know, it’s not just about the rush hour, it’s about left-hand traffic, but pretty soon I got used to it. It helped following other cars in front of me and to keep saying, while approaching a crossroad or a roundabout: to le left, Daniela, to the left! 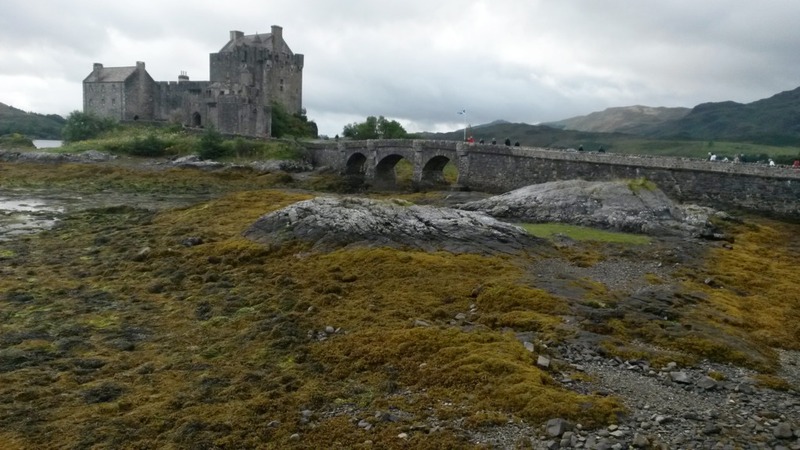 My main direction for the day was Eilean Donan Castle in the high northwest, but my first goal of the day was Castle Doune which stood for Castle Leoch. On my way, I found two huge metal horses standing next to the motorway at Falkirk. A while later, I found out these are named the „Kelpies“, about 30 meters high, standing in a park, right and left of a canal guarding the water as „water sprites“ usually do. It’s not really far to Castle Doune, it’s pretty close to a main road and well marked with signs. The car park was quite small and not at all sufficient on crowdy days, but I found a shady space. The outside looked pretty much how we know it as 18th century from TV, they also made lots of outside shots here. You can walk all around the castle, just next to the high and impressive walls. Unfortunately, I didn’t have time for a complete tour through, I just looked at it from outside and in the souvenir shop. 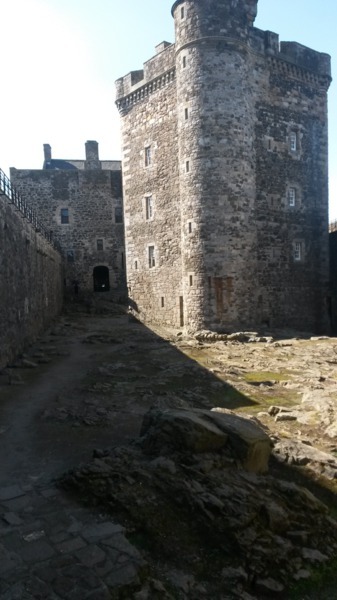 Here and in almost any other Scottish castle that I visited, I could find Outlander stuff in the shops, books as well as fan items, shawls, shirts and many, many more. On it went on the A84, A85 and A82 to the northwest and each time I had a beautiful view and a possibility, I made a short stop to look around. While doing this, I discovered my first highland cows next to a bus full with tourists from Australia. Oh my, they had a long journey! And then to Fort William. Yes, I’m aware this has nothing to do with “Fort William” from the series, but I think Diana Gabaldon just found that name while writing. 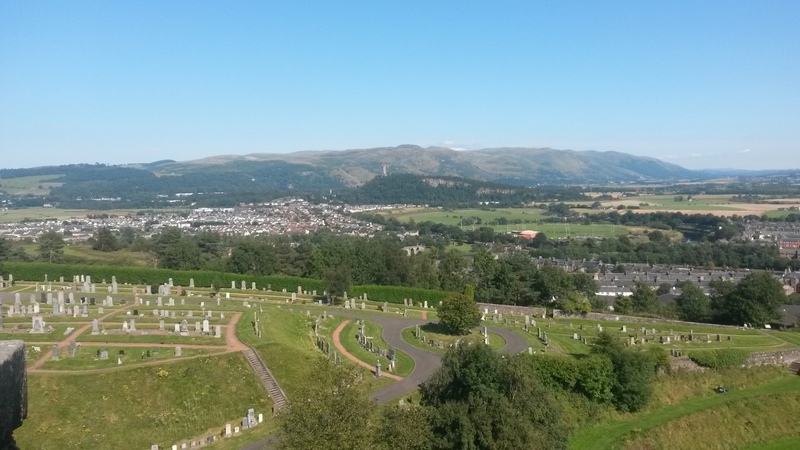 But besides, Fort William is a very special town, located directly on that tectonic rift that’s going aslant through Scotland and looks from above as if the northern part had been glued to the southern with some kind of bad glue. Thus, there is a chain of Lochs from Moray Firth via Loch Ness, Loch Lochy, Loch Linnhe down to Firth of Lorn, connected by the Caledonial Canal. Fort William is almost on sea level und still it’s next to Ben Nevis, which is with 1344 meters not only the highest mountain of Scotland, but of all Great Britain. So, it’s a good climb upwards and there’s no road or aerial ropeway to make it easier. You can climb it only by foot. Let’s see if can manage it in this life! On another pass with a car park on the A87 above Loch Garry, there were countless little men of small stones, as far as I could look and I was speechless, such as a young couple from Australia next to me. Along the A87, the landscape was getting rough and bigger. There were not many trees anymore and it was rockier. Sometimes, there were small side roads like this one with the small, hoary bridge as you can see many of them in Scotland. After a while, there were no villages anymore, just a lonely house now and then, just turns, landscape and repeatedly waterfalls to my right and left. It takes mile after mile, turn after turn, it’s a little hazy and dull, the only wee bit of rain that I would have in 5 days, until, suddenly, the landscape opens after another turn to Loch Duich and gets very wide. The same moment, the sun comes out, warm and bright, a very magic moment, the landscape looks enchanted and I’m deeply impressed and moved. 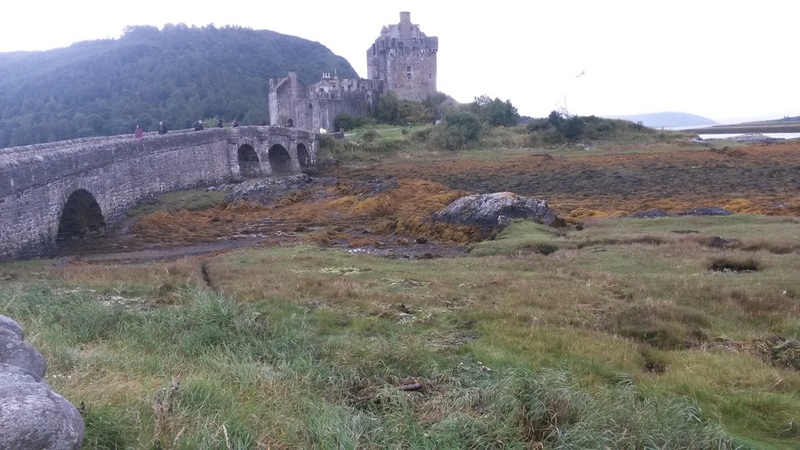 Now it was but a short way to finally reach Eilean Donan Castle near Dornie. Most pics that I know show the Castle in the water, for obvious reasons. When I reached the Castle, it was low tide and there was some strong smell of sea and seaweed. It was already about 4 p.m. and open only until 5 p.m. There were no guided tours, but you could walk all over, there were sign posts and supervisory staff whom you could ask. 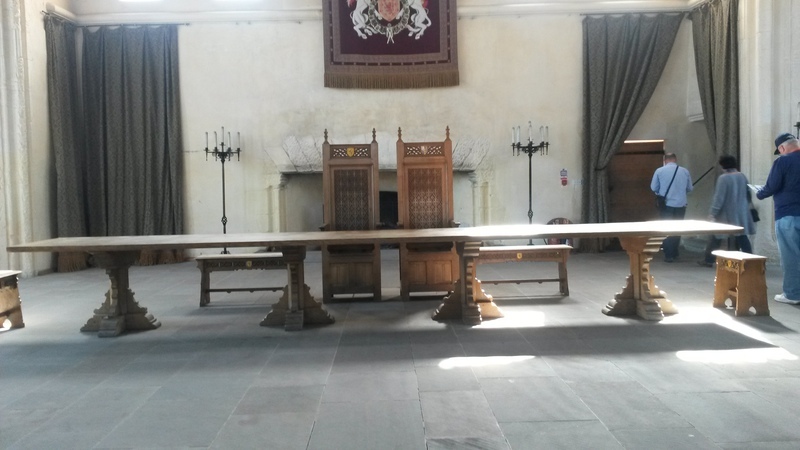 The castle is completely furnished as if people were still living there. There are also some figures to illustrate the location and even the kitchen is equipped with kitchenware, cutlery and artificial food. This visit is worth it and can easily be done within one hour. I drove a little further along to road until I reached the big bridge to the Isle of Skye, but this time I didn’t have enough time to go there (please see 2016 and 2017) because I wanted to reach Inverness that very day. Now I had to go all the long, endlessly curvy way back again until I got to the crossroads of A87/A887 to Invermorriston and I stopped spontaneously to take a hitchhiker with backpack with me. First, I had to clear the passenger seat which usually holds handy everything that I (might) need while driving, mobile, food, paperwork, purse, some water in the footwell, everything had to be removed let Denis get in. He was a student from Skye on his way back to university in Inverness. Alas, he didn’t speak Gaelic as I had wished to use some of my small vocabulary on him. But it was nice to have another person with me for a while. We passed Loch Ness where I stopped to take a picture and reached the city center of Inverness where he got out. 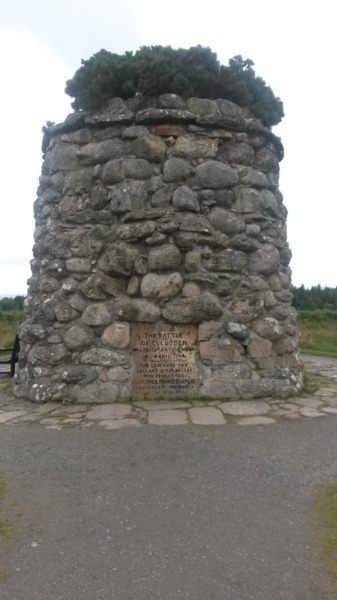 Now, I wanted to go to Culloden which is located above Inverness, but when I got there, it was already half past 7 and closed, so I had to adjourn this visit perforce to the next morning. Drat! Actually, I had wanted to leave early to have more time the next day, but that came to nothing. 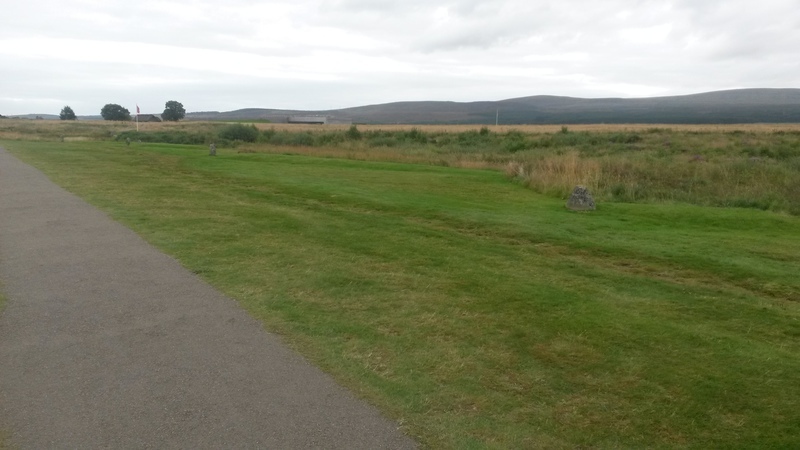 Culloden Moor is a must for every Outlander traveller. So I looked for a hotel, I had no pre-booking and this was good as I couldn’t have said before where I would end up on that day. The first 2 B&Bs I tried were both fully booked, but then I found a room in a Motel near the city borders, the room was quite ok with two Queen beds (one for my suitcase!). In the motel’s pub I got some dinner and football on TV. Qualification to the European championship next year, Scotland versus Switzerland. Scotland lost 0:2 but they took it with equanimity, they already know the qualification was lost. After dinner, I spent the rest of the evening at the bar in a nice conversation with a gardener named Paul from Inverness. After getting up, there was an unpleasant surprise: Instead of a shower, this bathroom had a combined bathtub and the reversing switch didn’t move which meant the water was coming only from the tub faucet, not from the shower part. Nothing did help, neither encouraging nor force or violence. I didn’t want to get dressed and complain, so I gritted my teeth and contorted my body under the tub faucet, got halfway clean and washed while it was extremely uncomfortable, but hey, it could have been worse, could it not? There was no buffet for breakfast, seemingly there were no much more guest and the cook made breakfast specifically for me. Toast, eggs and marmalade were ok, but there was some kind of fried pasty, small but thick slices such as our German “Dosenwurst” which is canned sausage. It was so salty that I couldn’t be polite enough to eat it up while I’m generally very much in favour of trying unknown food before judging. I mean, why travelling to other countries if you expect everything to be like at home? I checked out and left the car park eastern and found myself in front of a car approaching on my side, honking, when I finally remembered… oops, I was on the wrong side of the street. 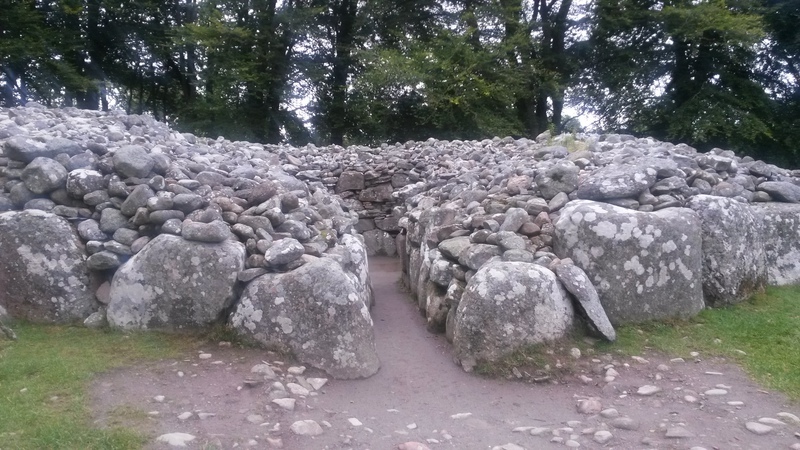 To Clava Cairns, it was only a few miles, it immediately after the junction to Culloden, about 1 km further a small road to the right, in a copse. 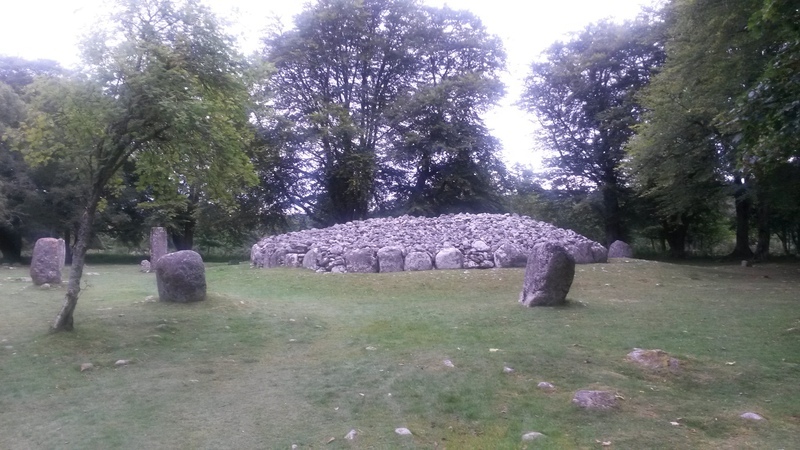 It was very early in the morning, the sun hadn’t fought through the morning fog yet and I was all alone on a clearing hosting three round stone collections, surrounded by stone circles. If you get aware that these stones are more than 3000 years old, you really get respectful. There’s an opening to the pile of stones about 1 meter wide with an extended opening in the middle. Nobody knows for sure what these buildings really meant to the men who built them. A magic place with a really specific atmosphere. I drove one km back, to Cullodon Moor eventually, gave the visitor center only a short view, I’m attracted by the field outside. 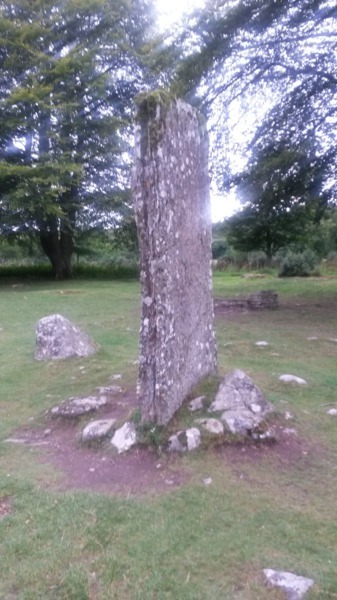 There are some paths leading over the high plateau and I first go to the big stone column that we already know from Outlander (even if they did not shoot there! ), then I find the small stones that have been set for each clan, as we do know. 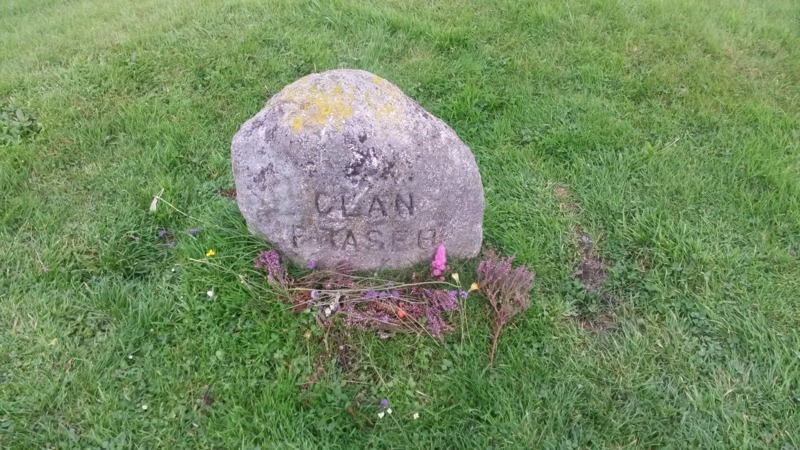 I laid down flowers to the stones for Clan Fraser, Clan MaxKenzie but also to that for the English soldiers. My respect for the place is big because I know, it’s nothing but a big graveyard and you feel that. 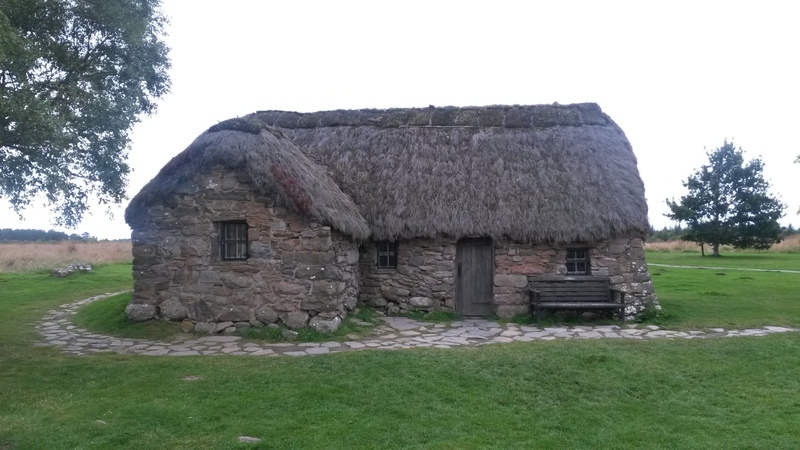 There’s small cottage on my way out that really looks like the one where the Jacobite soldiers sought shelter after the battle. Another house owned a huge weaving loom, occupying about half of the base area. In a free space between the houses, they started a fire with a kettle hanging from a tripod, someone stirring in it diligently. 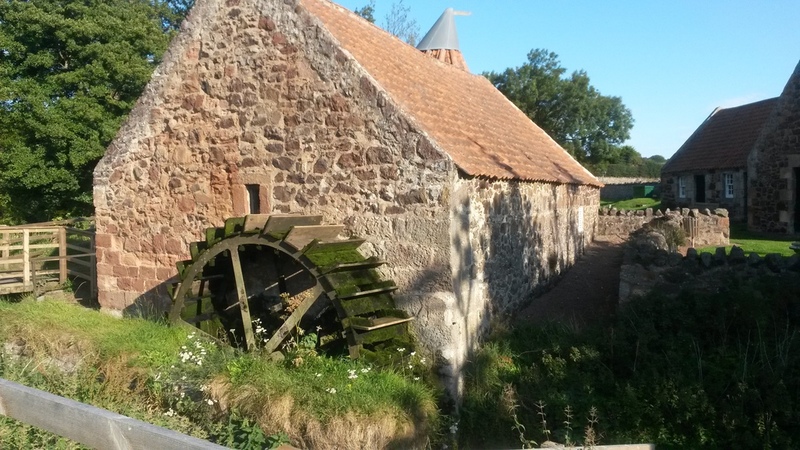 In another building next to this there was a big wood working lathe like those I know from medieval festivals. In a short conversation with the man working on it I found out that he’s from Schwäbisch Hall, Germany and moved over for love. Not the last German emigrant whom I would meet. It’s an extremely nice group of people getting bigger and bigger with every minute. I got offered so many things, from Outlander fan stuff for little money to homemade food and made the acquaintance of tablet which is sweet fondant baked flatly on a baking tray and cut into small pieces. There were also two big packages with t-shirts that came somehow and for granted from Amazon and I gratefully chose two of them. I would have liked so much to stay a little longer with these nice people, but – unfortunately? 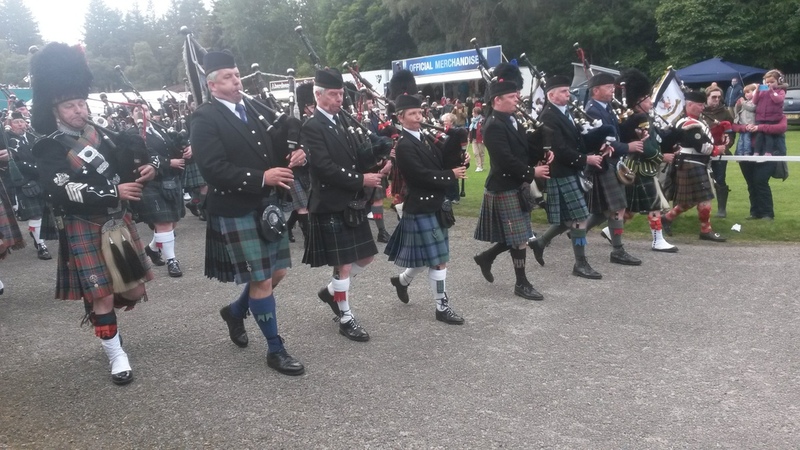 – I was heading for the Highland Games at Braemar, located in the highland mountains next to Balmoral Castle and those had started already in the morning. So, I wistfully took my leave from the girls because I was up to something I had been looking forward to for long – Tossing the caber! Balmoral wouldn’t have been worth going since it was September and this meant it was the Queen’s annual two-month holiday, the castle would be closed and the surroundings blocked. Not that bad. I already know I’d be back one day. It took me more than 1 ½ hours to get to Braemar near Ballater by car, to get there, I had to drive through endless woods on a large but eternally long national road. 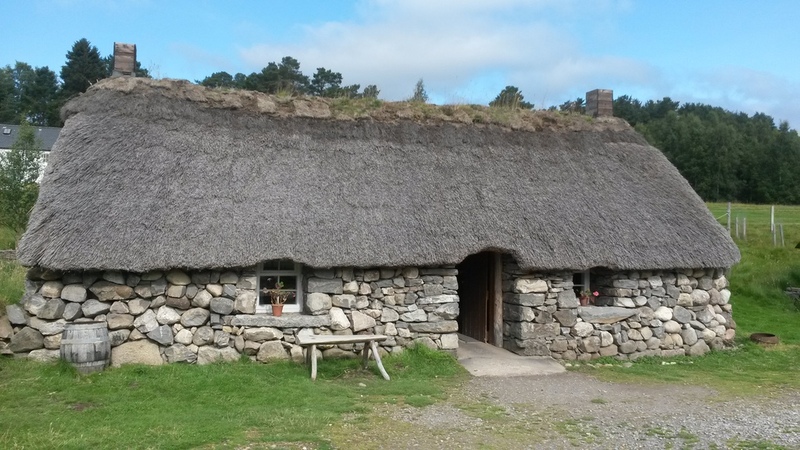 At a short distance to the village, I got a short glimpse on Braemar Castle (the road is closed and guarded), then I found a big car park on a field and a big parade of people walking down the road into the village and through. On the other side, no long walk though, we found ourselves in front of a highland parade getting into formation to walk to the festival yard. I passed by them to buy myself a ticket, I went for a standard as it was late already and the places on the rostrum already sold out. The ticket seller noted I was German and started talking about the Queen and her family, stating they actually had more German blood than British, Prince Charles for example by 57 % by ancestry. “You (the Germans) can have them all!” he said derogatorily. Ok, that was quick! He also expected the Queen and her family to arrive later, she came here every year since she was the patron of this festival (and besides, of hundreds of events and clubs). And really, while I still was walking by a line of selling booths, the parade of Highland bands started and then there was a line of dark minivans, carrying security staff and then the Queen and Prince Philipp in one car, some more in other cars, but the only one else I could identify was Prince Charles, all of them waving friendly to the crowed on both sides of the line. They drove to a podium on the other side of the quite big field from where I stood, I couldn’t get much closer, but some friendly people around me let me use their binoculars now and then. 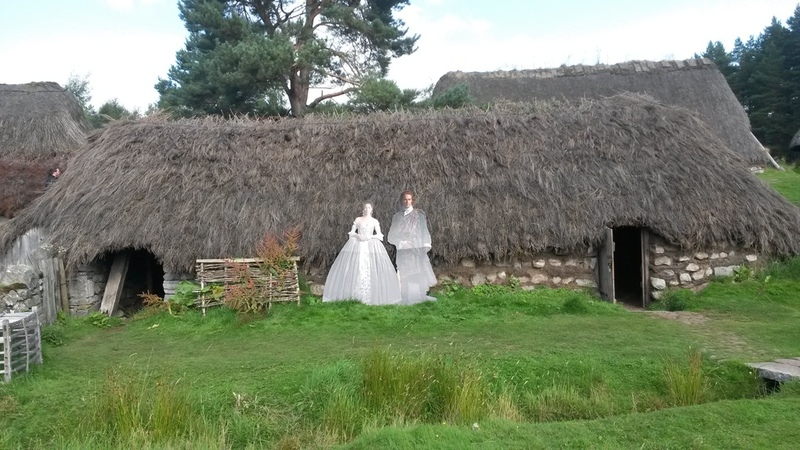 The Queen wore a red dress, Philipp and Charles wore a traditional kilt, but no-one could identify the young ladies on his side. William and Kate weren’t present and Andrew’s daughters looked different. Might be some of Anne’s? However, the afternoon was quite diversified, with many dancing groups of all ages on a small side stage, rope pulling, tossing the caper (finally!) 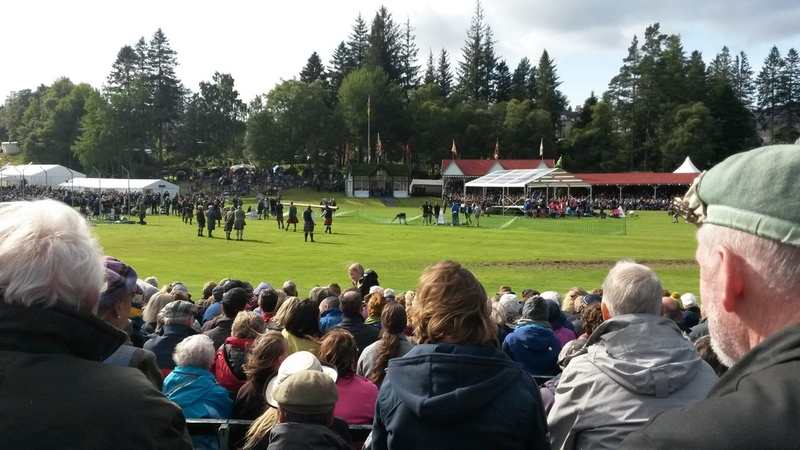 and many highland bands competing. There was wind on that highland field, but not much and fortunately, I had a windproof rain jacket with me. This was the only time in 5 days I needed a jacket by day, I had every day perceived 25°, this was t-shirt weather. 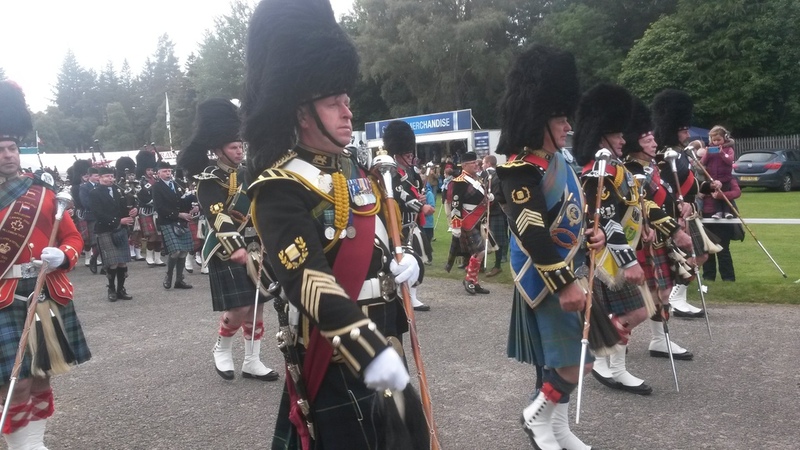 The Queen executed one award ceremony after another, then they left the place like they came in in a solemnly parade out, first the limousines with all the royals, then the highland bands in full armour playing music. I followed them and continued to my car, back to my next booked hotel, in Edinburgh again. That was not so comfortable since the distance was far, more than two hours, but when I booked the hotel, I didn’t have any route yet and didn’t know when and where I would be. This was the short prep time taking revenge. It’s really an advantage to pre-book hotels, but even if you work out your driving route in detail, there are still unforeseen things to happen ready to crash your plans. Braemar is located on a two-way road only and since I didn’t want to drive all the way back I came in the morning, I took the other direction leading into to mountain. These mountains, unlike the others, were blank hills first, with small rivers and green grass, but soon getting higher and higher, leading to a ski resort and finally back downhill, on sheer endless roads with some outrageous turns, only very few cars on the road, all of them in my direction in an incredible speed, southern towards Blairgowrie and Perth. Back in Edinburgh, I looked for my Hotel, the Frederick House Hotel, located on Frederick Street and George Street, in a very beautiful old district with houses built of brown sandstone. There was no car park to the hotel, but I found a space on the main road where parking was free until 8 a.m., like the other day at the hostel, so this was fine for me. When checking in, this was the next surprise since the nice woman at the reception was from Germany, from Hamburg if I’m right, and she also moved over to Scotland on account of love. 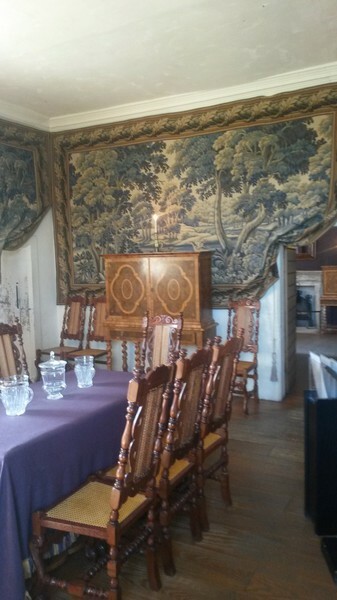 This hotel was a very old building, beautifully refurbished and decorated old-fashioned and manorial. After getting redressed, my stomach was almost down to my knees, breakfast had been long ago and the day quite long. I asked Stefanie at the reception for a restaurant recommendation and she sent me to Fisher’s in der Thistle Street. A very good advice, I must say. What??? How could that possibly be? I mean, studios were in Cumbernauld, next to Glasgow, but I was in Edinburgh, walking into the probably only Restaurant with an Outlander extra working on that very evening? This was probably almost as rare as winning the lottery jackpot. And it happened as promised. The young man – Graham – who introduced himself an hour later with a wild beard, I wouldn’t have recognized him in no way. He told me quite a lot (he was allowed to) and unfortunately nothing he wasn’t allowed to, however, this was quite much. He had been the scribbler (in the penultimate episode season 1) of the English soldiers, when the condemned were to hang – without his beard then. And on the witch trial, he was on of the Scots sitting in the crowd and screaming “burn’em” – with beard. For most of the shooting places, he didn’t know their exact location because actors usually were driven there by minivan, but he could e.g. give me the advice for Tibbermore Church, that wasn’t easily to be found online those days. Gratefully, I said goodbye to Graham and to one of the most striking days in my life. The next day started with a bright and clear Sunday morning, I would have liked to go to church, but nothing was to be found in the neighbourhood and wished to use the early day, so, after breakfast (in the café over the road where hotel guest can eat with a hotel voucher) I turned to the countryside. 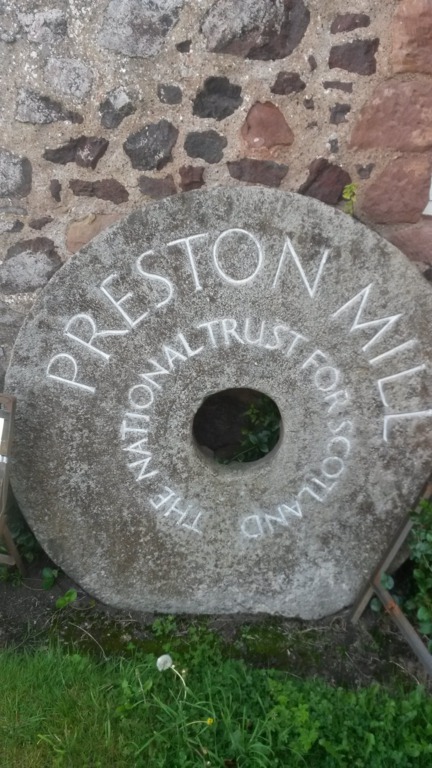 For this day, I had some shooting places around Edinburgh on my list and decided to start with the only one in the East – the place where they shot for the mill, Preston Mill in East Linton. It was quite easy to find, directly on the main road and on a dewy meadow. I was told the ditch had been dammed so Jamie/Sam had enough water to duck in. Then I turned west as a few shooting places where located pretty close to the southwest of Edinburgh. 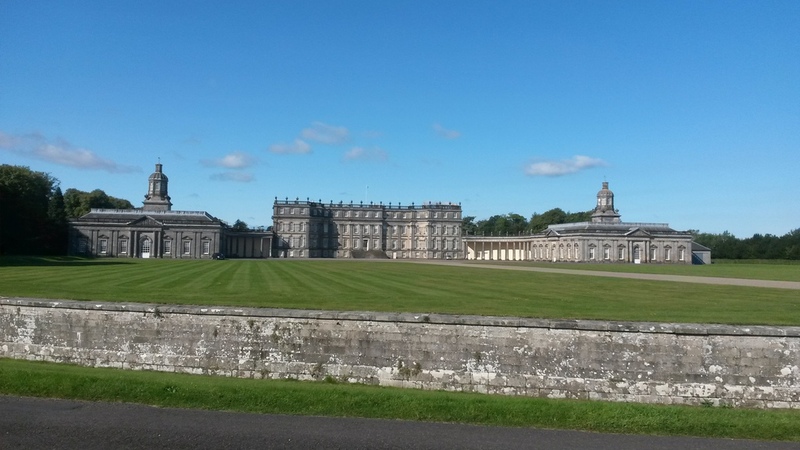 Hopetoun House next to Queensferry stood for the Earl of Sandringham’s place where Jamie had to fight the MacDonalds. For the reason of a renitent GPS (insisting to sending me into a one-way road from the wrong side!) this was not easily to be found, but then it was beautiful, a small road directly leading by. Very close lied Midhope Castle (Lallybroch) – between Queensferry and Blackness – wonderful, you could easily fall in love with it and it really felt like coming home. 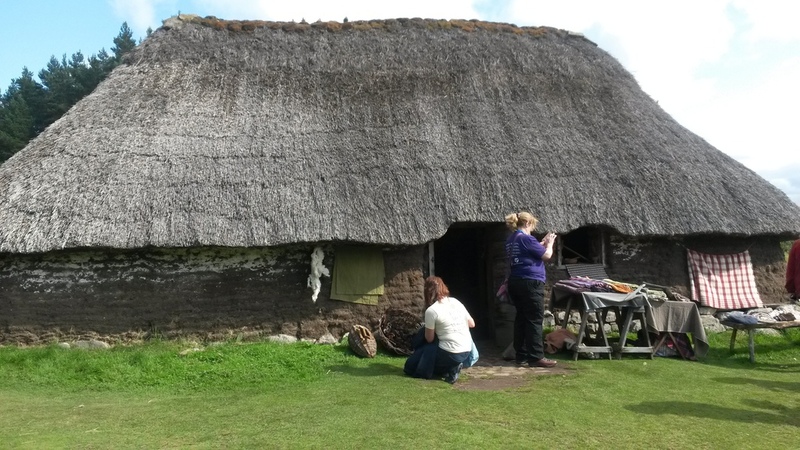 It didn’t look like we saw it on TV, neither was it habitable as we saw it in the 18th century episodes nor was it a window- and roofless ruin as we saw in the 20th century episode. I could leave my car about 200 meters before, next to a small garage and followed the small road until I had that famous look from beyond and could walk uphill to the archway. I’ve never seen so many free-ranging pheasants before! 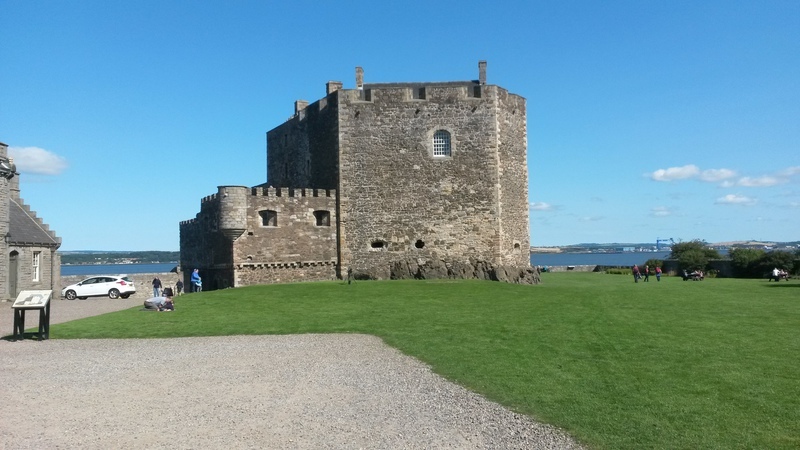 The next one was Blackness Castle, standing for Fort William, lying directly by the see. Because of its shape like a ship it’s called “the ship that never sailed”. 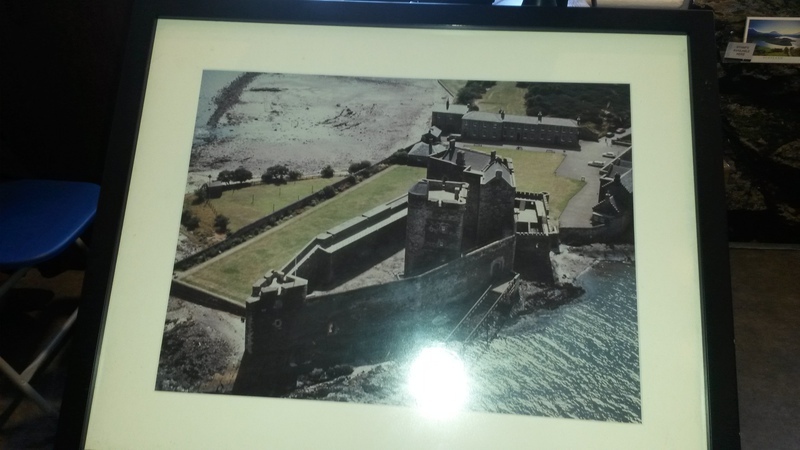 I bought a ticket in an office opposite of the castle and the young woman who sold it was proudly talking to me as a fan about the shooting that had taken place there and I went on to visit the castle. There was no guided tour, leaflet or audio guide, but this wasn’t necessary, there were explanation boards on all relevant places in the castle. 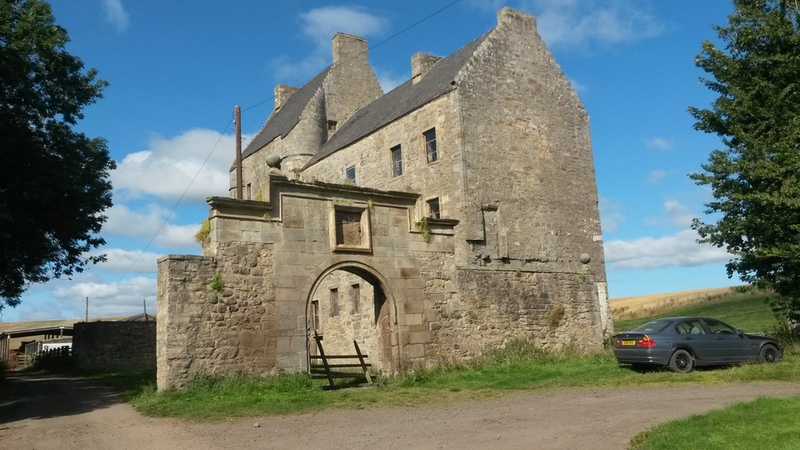 Only season 1 had been shot there so far, only later they would shoot the scenes with Roger and Brianna and they left the post where Jamie had been flogged for a while, but not when I was there, so please look out for it! The ground in the center of the castle was partly rough rocks so I had to walk carefully. 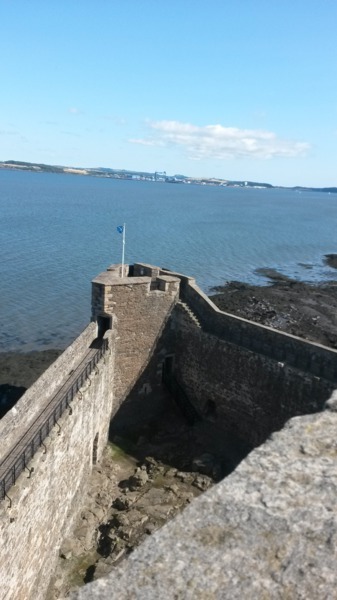 On the upper balustrade on the wall there was an amazing view over the bay! 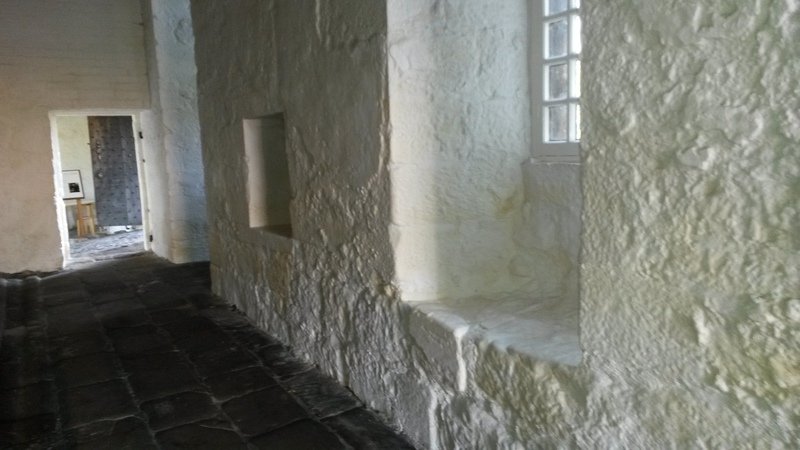 However, if Jamie and Claire had jumped from that wall as seen in episode 9, the crash would have been hard – no water beneath. 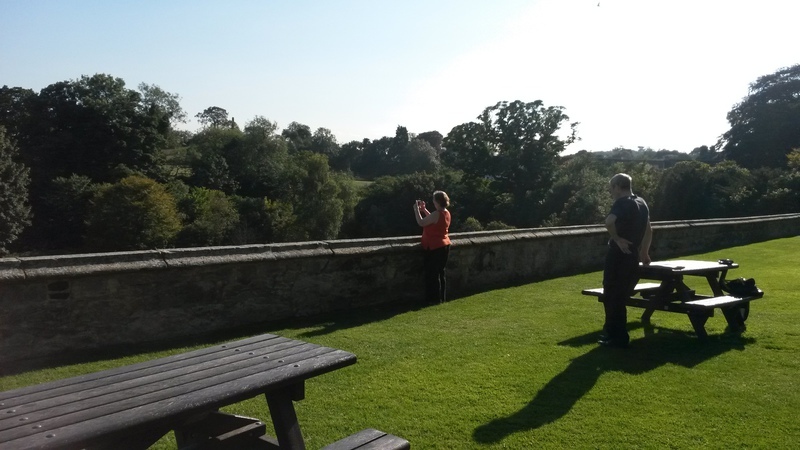 Next was Linlithgow Palace, here they shot the scenes for Wentworth prison, at the entrance gate. 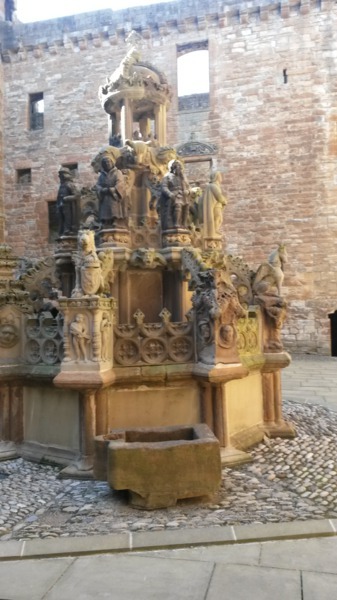 In the courtyard, there was a wonderful stone fountain with many figurines on it, built for King James. Well worth seeing! 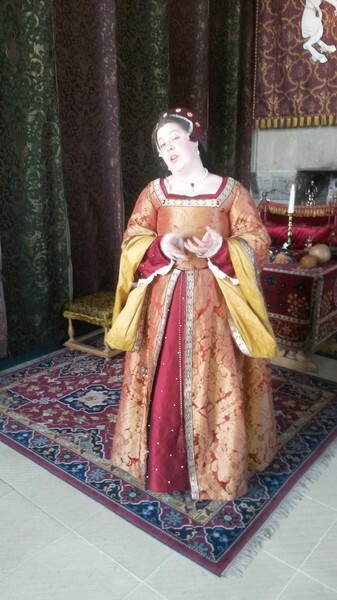 Mary Queen of Scots was born here. 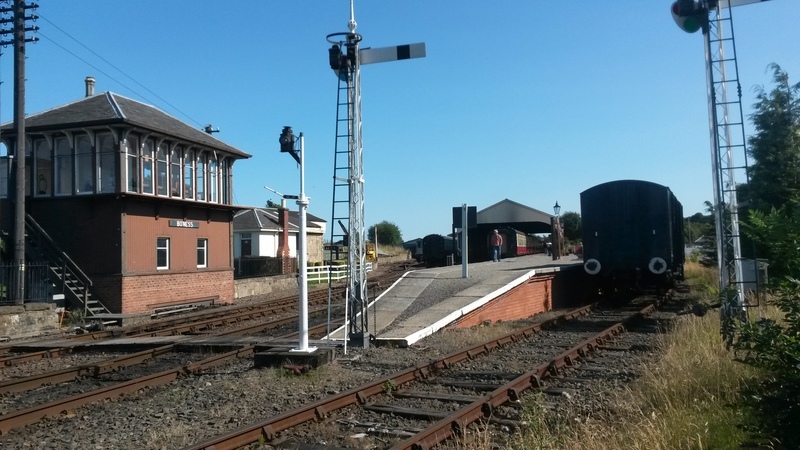 Then a short stop at the historic train station of Bo’ness where the shot the good bye scene with Claire and Frank. Following I drove over the Firth of Forth to the historic Kingdom of Fife, northeast of Edinburgh on the coast, to one of the most beautiful pieces of jewellery of the shooting places, Culross. The pronunciation is unusual, something like Curross with a rolling R. (I would visit this place a few more times later.) There are 1 or 2 bigger car parks on the western boundaries, it’s best to leave the car there since there are not many parking places within city limits and it’s not a long walk. 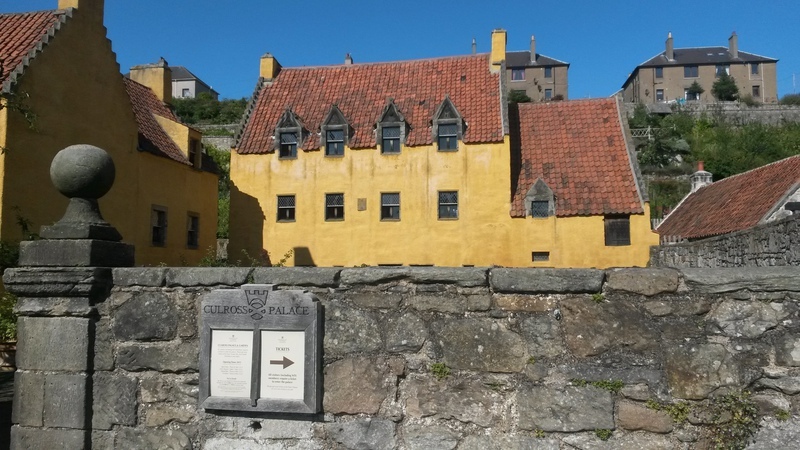 There I found Culross Palace, bright yellow and with those small stained-glass windows that we know from certain scenes. In the building to the right on the place, tickets can be bought, either for the palace only, the terrace gardens or both. The designation “palace” is a little exaggerated, it looks more like a bourgeois city house, but nevertheless very beautiful and worth visiting however they hadn’t shot there (until then, they did later for season 2, please look bus tour 2017). 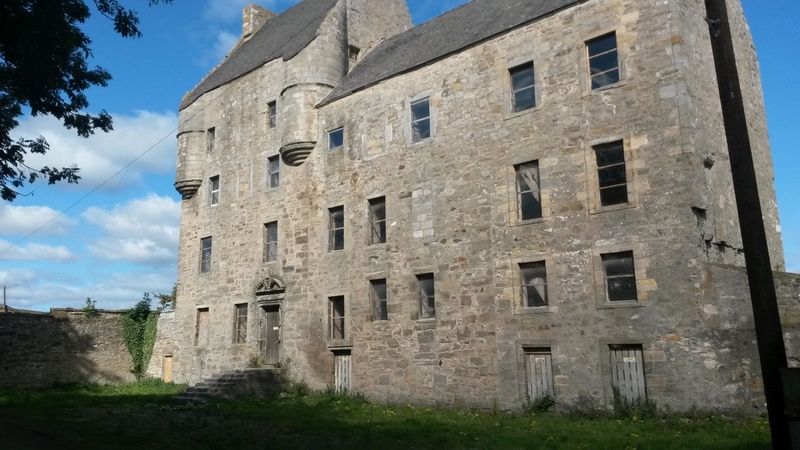 But behind the palace, there are the gardens, climbing up the hills in terraces where the garden scenes with Claire and Geillis have been shot. Just beautiful and enchanted, particularly in dream weather like I did have. Actually, it didn’t rain at all on these five days, so this was a complete contrast to the proverbial rainy and cold Scottish weather to be expected. 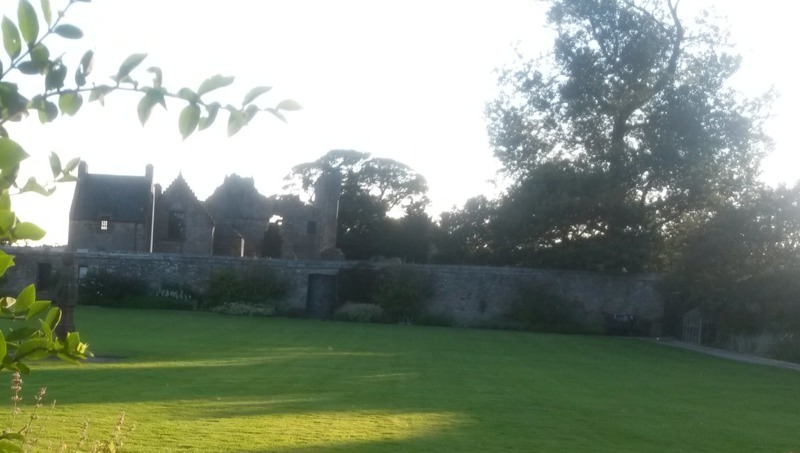 A little further to the east, there is Aberdour Castle, standing for the Abbey where Jamie was hiding after his rescue from Wentworth prison. Unfortunately, I arrived late on that day (after 5 p.m.) and the castle had already closed for the day so I had to postpone this visit to the next day, even as it was lying really far east meaning another long drive next day. 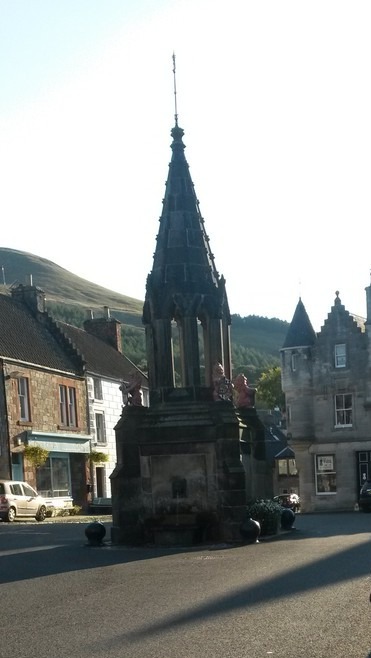 So, I turned west towards Glasgow and my last point for the day, Falkland, a beautiful old little city standing for baroque Inverness. Why? The simple reason is, there is no place in modern Inverness looking like old Inverness and Falkland has lots of historic city centre. Furthermore, the old buildings have been modified slightly in reality and by CGI to be authentically 18th century by removing plates wires and such, but looking at them, the scenery could be easily imagined: Mrs. Beards B&B, the shop where Claire stood in front of admiring the vase and, most impressive already at first view, the fountain that stood in the middle of the road, where Frank met Jamie’s ghost in the thunderstorm. I drank a coke in front of the pub and also had a look around inside, it’s a pretty old house full of history. 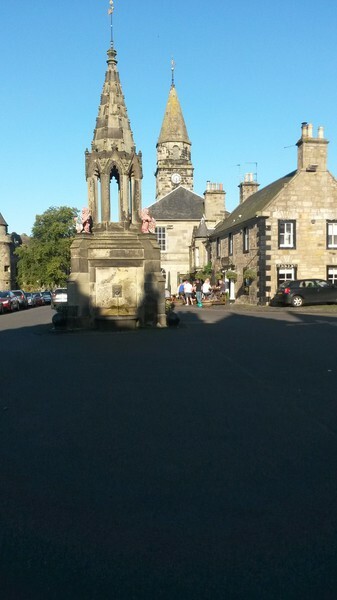 There also is a Falkland Palace that I would visit one year later. It was already late on that day and I still had to look for a Hotel which I took a few miles to Glasgow, Premier Inn in the outskirts of Cumbernauld, not really cheap, but very new and modern, with a restaurant for dinner and breakfast next morning. Wi-Fi was unruly first, but the friendly young man at reception could help. 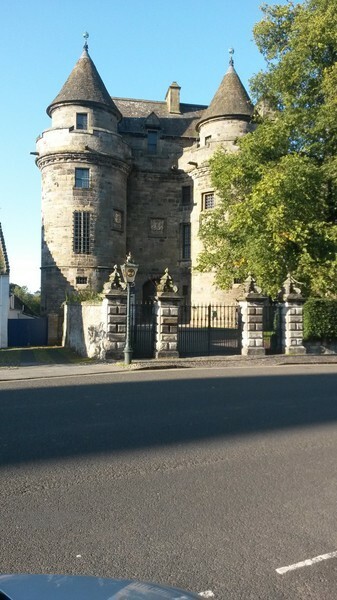 Sad, nobody knew anything about Outlander yet, although the studios were not far from the hotel, but back then, the series was almost unknown in Scotland. The next morning, I couldn’t help myself but visiting the industrial zone nearby where the studios are, knowing that there was no chance to go in, of course. Nobody was to be seen outside either, but I couldn’t leave the place without taking a picture for the very least. I proceeded to Glasgow going to George Square, where the wedding of Claire and Frank had been shot. It was quite easy to find a parking on the side of a main road leading to city centre, only 2 or 3 blocks from George Square but I had to wait there until 9 a.m. when parking would be permitted, I couldn’t even pull a ticket at the pay station earlier. With my cell phone GPS, I headed to the famous and huge place which is well worth visiting, including many monument, statues, trees and flowers, full with people and cars around on the many side roads, but I soon recognized that they couldn’t have shot here as in TV, the scene took place in a “normal” road with buildings to the left and right and not on an open square like this. So, I started wandering systematically around the square, looking into all the side roads and asking people in the shops, thinking that if they had shot here nearby, somebody must remember. But no luck, nobody did know anything. Meanwhile, my one-hour parking time was almost over, so I went to the restrooms in a shopping centre and back to my car in order to avoid a parking ticket that could be painfully expensive as I remembered from my visit to England a few weeks earlier, I didn’t need this once again. On my way back, I met a guided tour that was about to start and asked the tour guide thinking he must know this – but again, no, Outlander? What’s that meant to be??? Almost unbelievable, but the series hadn’t aired in Scotland yet, unfortunately. Quite discouraged, I proceeded to my car and – what can I say? Two blocks east from George Square, which I had absolutely overseen on my way, there it was: John Street. In my mind, I cursed the advising internet sites and was relieved in the same time since I eventually found it! Parking time was clearly over then, but nothing had happened, fortunately. When my GPS told me “you have reached your destination” (meanwhile, I know better, the post code was not correct), there was nothing to be seen, no sign, nothing. I searched around the crossroads, asked a few people living there, but nobody could help me although we were less than 1 km from the place. The last woman I asked sent me back to the T-crossroads to leave my car there, “they always do so” and told me to climb over the fence, cross the sheep run and down to the river. Parking was no problem; the crossroads was extremely large and there already were a few other cars. With a somehow bad feeling – I don’t do such things regularly! – I climbed over the fence to the sheep run and saw a path diagonally crossing their meadow and leading downwards on the backside, towards the river and the gorge. The sheep didn’t like my being there, intruding into their space, bleated complainingly but left me alone otherwise. There was a young forest behind and a stile to cross another fence, then I went further downhill. But no matter where I tried, it was turning down extremely and I recognized I couldn’t go further. There was a fence next to the river keeping me from it, there was only a very small creek going underneath but unless I wanted to dive under the fence (and I clearly did not!) this meant a dead end. In a laborious way I climbed uphill again, crossed the stile and turned left again towards the river. It was so extremely steep that I had to take hold on one small tree after another, cautiously taking small step by step and hold by hold to avoid slipping and falling, more than all to prevent me from hurting myself and there was one thing I knew for sure: There was no way back, no way to get up that hill again! Quite dirty, I eventually reached the small river that I came for, to my left the landscape was open and flat, to my right was the opening into the gorge. But I had another problem: I was on the wrong side of the river! On the other side of it, there was a small shore stripe, where I stood just rocks. There also were a few young people who were quite astonished where I had come from, they told me they just had crossed the field on the other side and that a little further up, there were also steps leading to a point in the middle of the gorge (I had no possibility to find these since I had been on the wrong side of the river!). I tried to cross the small river with dry feet by hopping from stone to stone, but they were too small, I failed and finally accepted that it just didn’t matter anymore and my trainers were sopping wet. You could walk on the small stripe into the canyon, about 50 meters, where the canyon was larger and there were some more people. Some of them had even taken their shoes and trousers off, walking further up the river and I could see a stone like a mushroom where a girl was posing on and another one taking pictures of her. This was the Devil’s Pulpit, the name that this place was also named after. The gorge was of dark red sandstone with many green plants, it was quite dark because no sun could reach this place and there were many trees above, it was an absolutely magic and enchanted place. Right here, Claire hat been discussing with Dougal about her upcoming marriage and I easily could find myself in that scene. Much more difficult was the imagination of the production team bringing all that shooting equipment down here, just madness! Back to the car, I took my way across the field to the east, passing the steps that I would use on my next visit, one year later (which I didn’t know then, of course). But if you believe, this was going to be much easier, you’re absolutely wrong! Nothing for milksops and pantywaists and not to be done alone! But no matter how exhausting the morning was – it was very well worth doing it! Back to the car at the crossroads, I had to change trousers, socks and shoes before I could drive further, not only were they wet and muddy, the jeans even had 2 holes from the barbed wire fence, but from then one it was named my “Scotland jeans”. Now to Stirling Castle, ancestral seat of the royal Stuart family, very prominently located on a rock plateau and visibly from far already! 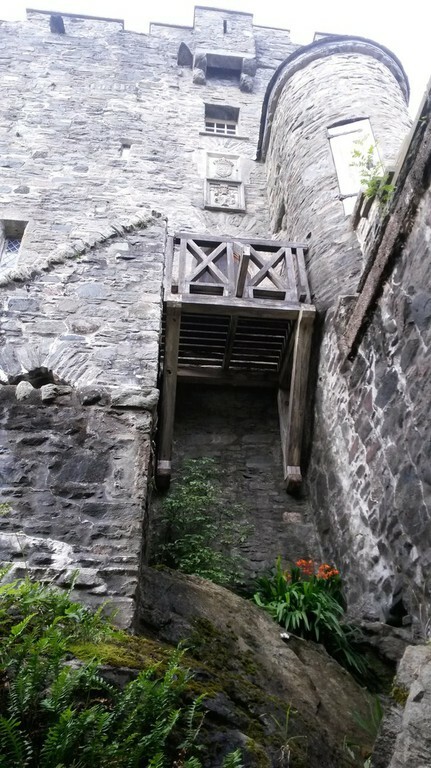 There is a car park next to the castle, but I already found a place in one of the small roads leading upwards. 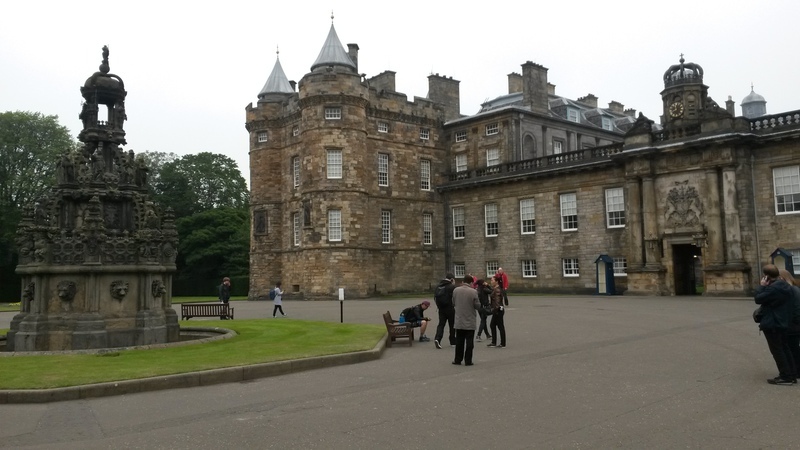 When I bought my admission ticket, I was suggested to buy a pass for 3 castles including Edinburgh and this meant a cheaper price for the second castle already so I chose it because Edinburgh castle was going to be on my list for the next day. It was shortly after 1 p.m. and the next English tour was advised for 2 p.m., but since I didn’t want to wait for almost an hour, the ticket seller advised to go to the battery where I was lucky to catch up with the tour that just had started. 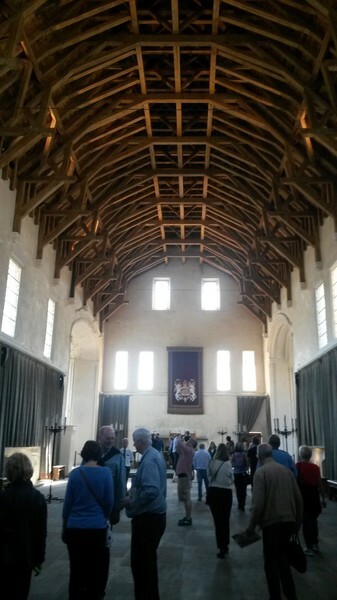 Stirling castle is a quite big one, one of the most impressive parts is the great hall with its huge roof construction out of Scottish oak, still smelling intensively after hundreds of years. On the other side of the courtyard, in the family rooms, we met a lady in an elegant dress, representing one of the lady’s maids of the Queen, representing 16th century and we had a fabulous conversation about renaissance clothes and dancing as, after all, I’m in Germany in a dance group for medieval dance (Patrizier – Bretten). 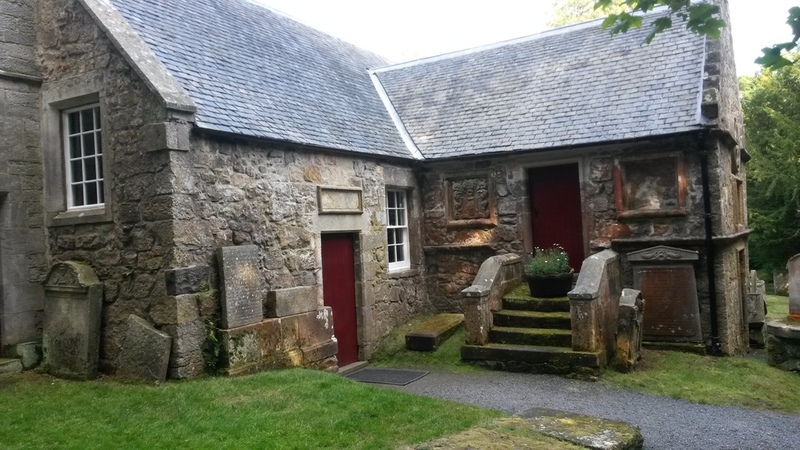 Also included in the entry fee was the estate of the Duke of Argyll, Argyll's Lodging, this was only some hundred meters downhill towards where my car was parked, a beautiful historic site, lovely and fully equipped with authentic furniture in 17th century stile. Before I left the castle, I had also got an advice for the Wallace Monument, built in honour of William Wallace, the famous Scottish fighter for liberty from 13th century. They gave me the post code for the monument which made it very easy to find it, only 2-3 km away. This monument was a squared tower, also built on a hill and visitors had to leave their cars in a car park at the foot of the hill where shuttle buses, small minivans, took visitors uphill for only a small fee. On ground level, there was a pretty exhibition and a souvenir shop and the view after more than 200 steps was absolutely fabulous – remember, a tower on a hill, you couldn’t get higher! It was just Wallace anniversary year, 20 years since the movie “Braveheart” so there were also live acts like this one, sword fighting in historic clothes. 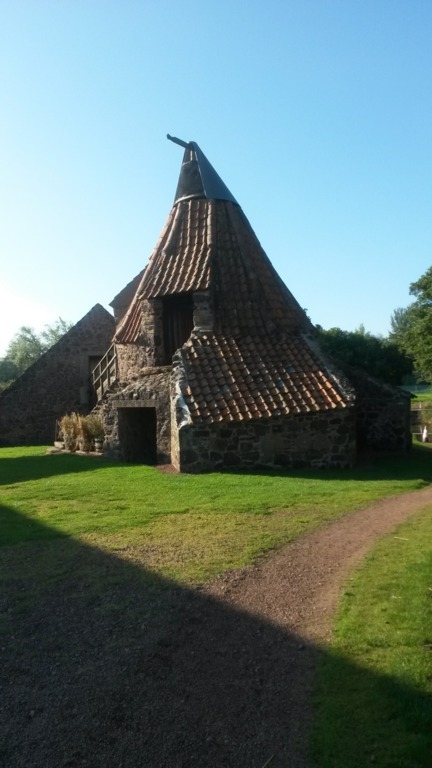 From there I proceeded northwest to Tibbermore Church where they shot for the witch trial. The advice was given to me by Graham and although he couldn’t give me the exact location, he knew it was somewhere next to Crieff. With some online research (nowadays you can find it online much easier! 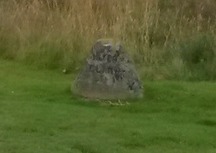 ), I found it next to Perth, not far from the motorway A9. The church was on an old graveyard with graves mostly from 19th century, located somewhere outside the small village and I had to search and ask. The waitress in a shop with café on the crossroads next to Tibbermore very well remembered that the TV team had been there for about two weeks the year before, there had been much hustle and bustle and the production team blocked hotels and B&Bs all over giving the businesses great rates. 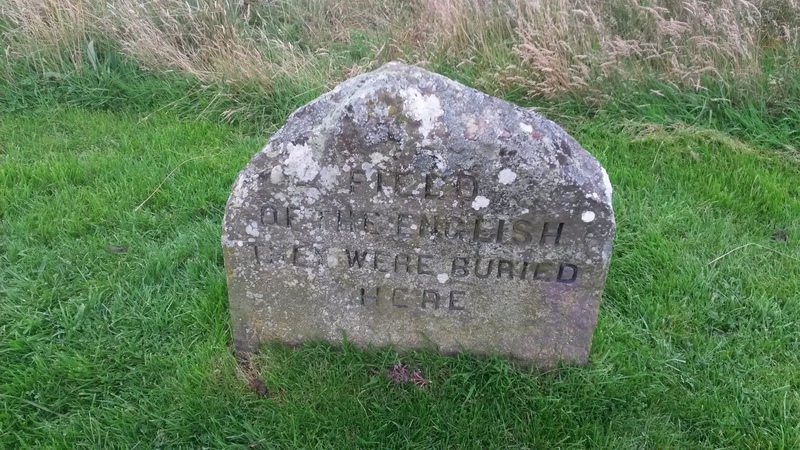 The graveyard was just a few hundred miles uphill, outside the village. There was space for 2-3 cars near the graveyard gate which was open, but unfortunately, the old church was not. Quite disappointed, I had to leave the place undone (one year later I was successful, please look 2016). And now to again to Aberdour Castle before it got too late once more, it was quite a long drive to the east along the north side of the Firth of Forth. One half of the castle was consisting of ruins that I could walk through and the other half were well preserved buildings to visit, including a housing unit. 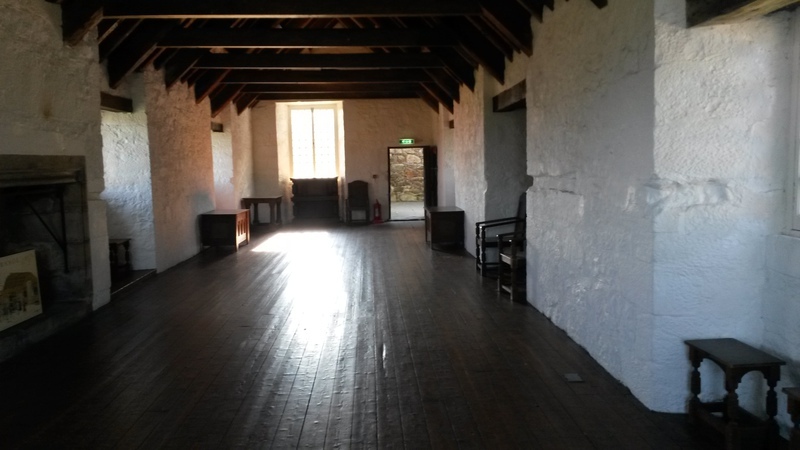 There had been shooting in the old kitchen, on the terrace (where Claire discussed their further plans with the Highlanders after Jamie’s escape from Wentworth prison) and the corridor where Claire threw up. 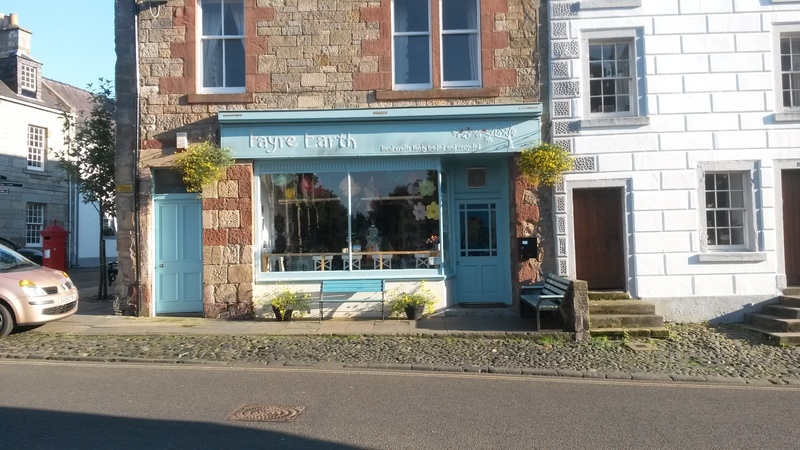 On my way back, I once again drove through the beautiful village of Culross (instead of taking the country road aside) towards Edinburgh on picturesque roads along the Firth. 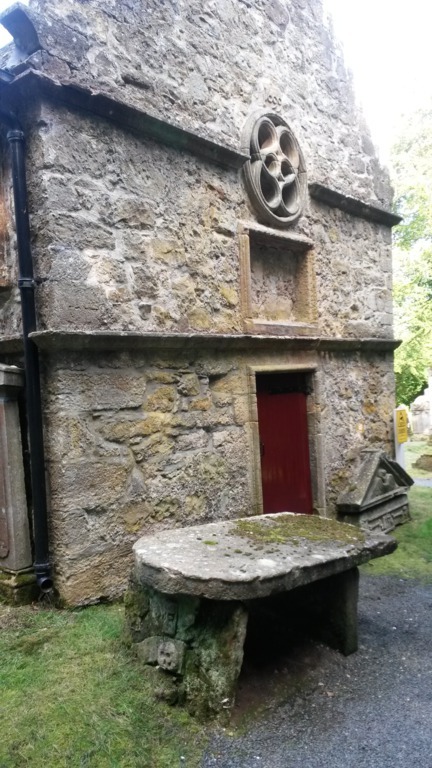 In the south of Edinburgh, I was looking for the wedding chapel. My GPS sent me into the middle of the forest on one country lane after another and I know I never would have found anything here with a map only. Even when the GPS announced one mile earlier You have reached your destination – I just continued and eventually found Glencorse House. They have a homepage and everybody can book the old mansion, a pavilion or the whole estate for weddings etc. The gate was closed, I rang the doorbell and heard from a lady on the intercom that this was private property and closed and that I would’ve needed an appointment to get inside. Reluctantly and quite disappointed, I had to leave the place undone. 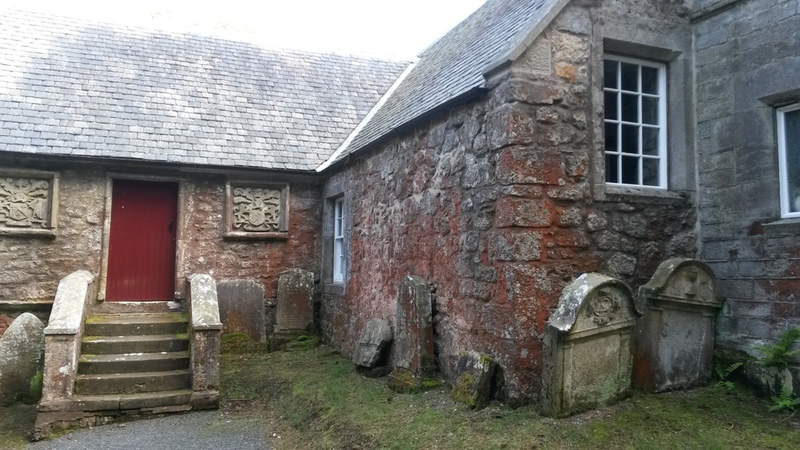 This was after the closed Tibbermore Church my second bust on that day. I wanted to spend my last night before the flight back in Edinburgh. It was already past 7 and I had no room yet for the night. With the help of my mobile, I called a few hotels on the price range from cheap to expensive, but they either were fully booked or had no parking area that I implicitly needed for my rental car. As everybody knows, in the city centre, there are usually no parking spaces at the roadside. Finally, I found one at more than 100 pounds at Haymarket, a friendly young man on the phone confirmed everything to me, yes, they had a free room and a car park and he needed my credit card details to make my reservation sure and I gave them to him, eventually. When I finally arrived there in heavy evening traffic, it was already past 8, so quite late and I found the hotel located in a neighbourhood that was busy with much traffic and lights but no parking at all. I kept searching, drove twice around the block, no luck, no parking to be found and I stopped in a side road in front of the Hilton and called the hotel again. Most unfortunately, the friendly young man had finished work and the young woman on the phone was as helpless as she was incompetent, I kept asking and ended up sitting in my car directly in front of the hotel, just stopped my car there ignoring the green lights in front of me and could see her through the show window talking to me, still unable to tell me where their car park was. Eventually, I gave up, threatened her “don’t you dare to charge my credit card!” and called the next hotel on my list, the a little more expensive Apex Hotel on Grassmarket. They had a car park of their own and I didn’t care anymore about the money, 4 stars and 120 pounds, but it was for one night only. When I finally got to my room, it was really late and I was about to starve. 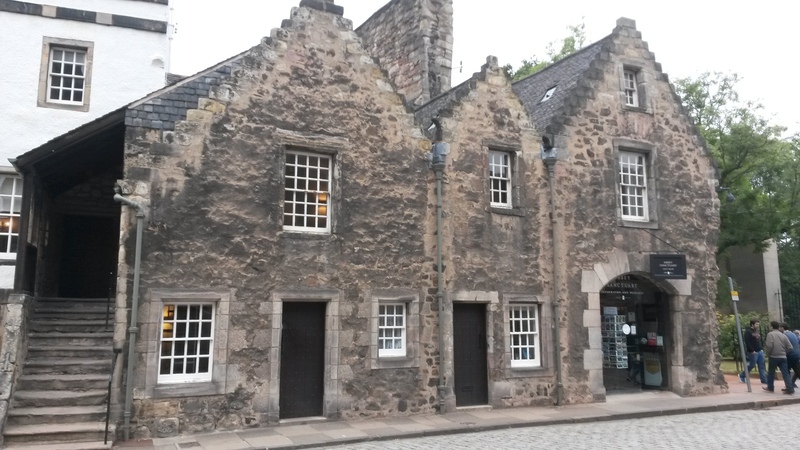 But fortunately, Grassmarket is a pretty little square with quite a few, very appealing restaurants and pubs. The decision was not easy and I ended up in a French restaurant (yes, I know, I was in SCOTLAND!) whose waiter addressed me in French and I automatically responded in French. The three-course meal was more than delicious and the company of 4 men at the next table quite entertaining, one of them had studied German philology. 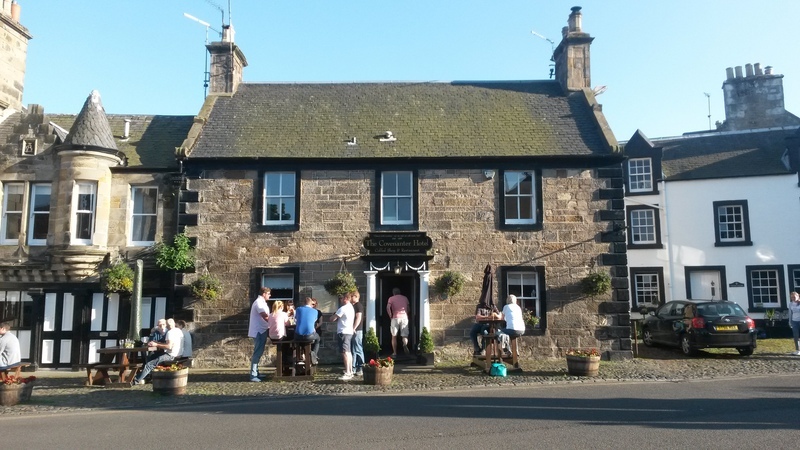 After dessert, I left and went to a pub next door where I let the day fade away with a pint and typical Scottish music until I eventually fell almost dead into my bed, this day had been really exhausting. My last day was entirely meant for Edinburgh until my flight back to Germany in the late evening. 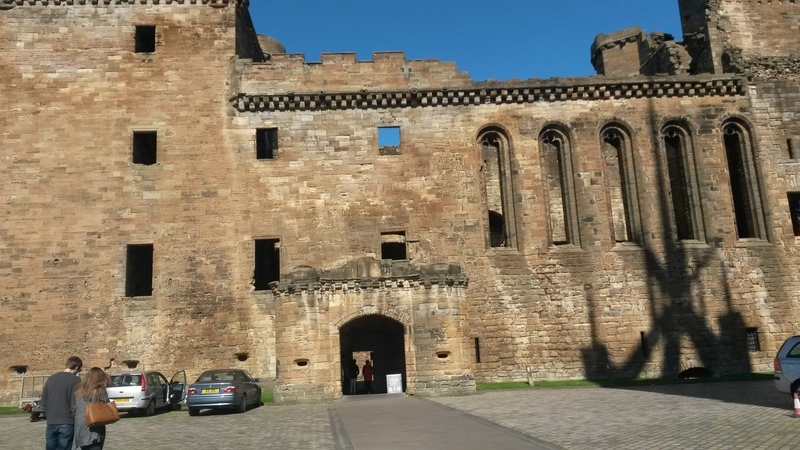 My four-star hotel was quite chic, the breakfast room was on the 4th floor with an end-to-end glass front and a direct view to the castle wall, mainly to the enormous metal scaffold emerging from the Esplanade over the abyss. I recognized this as the tribune scaffold of the annual Tattoo (taking place in August every year, please look at 2016). It was still early morning when I checked out, but I got permission to leave my car in the car park during the day, thankfully. 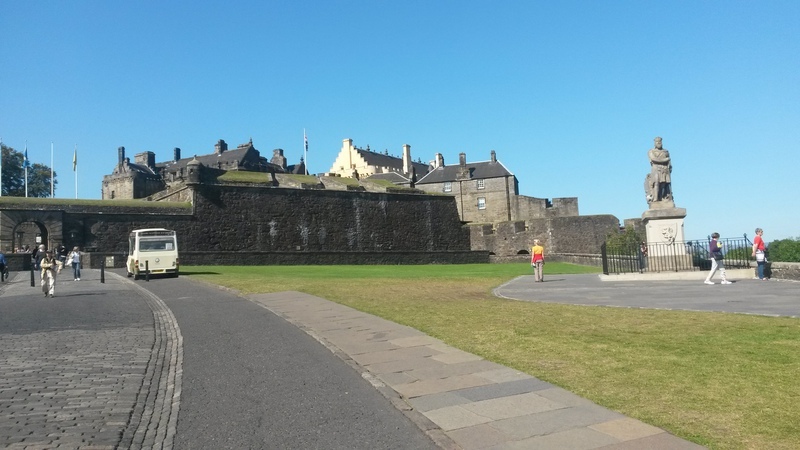 I wanted to explore Edinburgh by foot, so I took the steep ascent towards Castle hill, Grassmarket is located really deep down and the castle lies on the back of an extinct volcano. Well, the last eruption happened more than 100.000 years ago, no worries about that. The castle was not open yet, so I spent some time in the souvenir shop below the Esplanade where I found an amazing teacup that I carefully stowed in my purse and some gifts for my family. 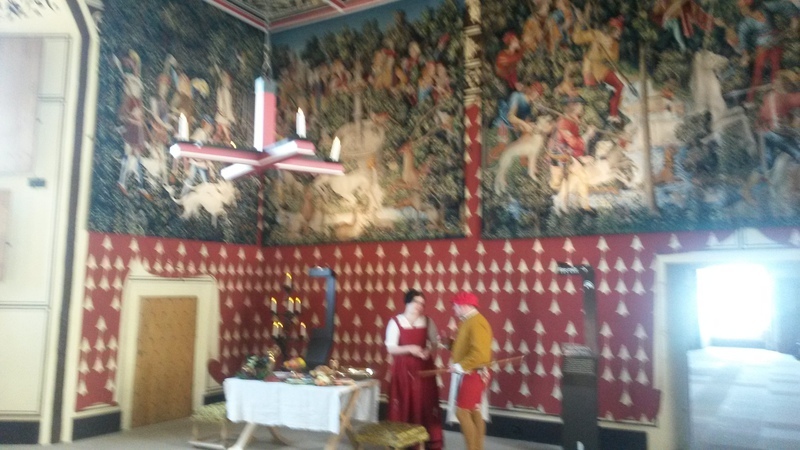 The castle pass that I had bought the other day in Stirling Castle (really pays off if you want to visit several points of interest included) was a really good recommendation since I could join the short queue for people already having an entry ticket. Good luck for me, the other queue was already terribly long even half an hour before the castle opened and I was almost in front of my queue. While waiting, I learned that the scaffold (huge and ugly) was built up every year, taking two months to build up and 1 month to dismount afterwards (see 2016). 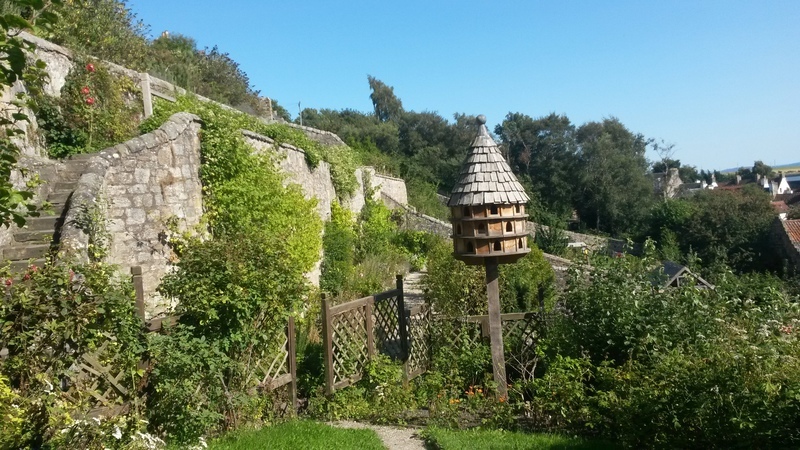 The castle offered audio guides, highly recommendable! 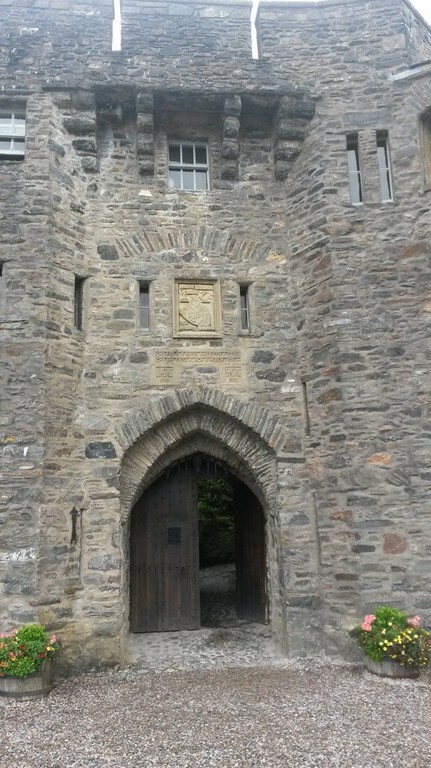 Since I was one of the first ones to enter the castle – there was only one group with me including their most pushing tour guide – I comfortably could access everywhere, look at everything in peace and quiet and had no crowd, they were always behind me, walking from place to place by numbers. The view from above over the city also would’ve been great, but unfortunately it was dizzy and the sun came out only by noon. In Scotland, a jacket should always be handy. Leaving the castle towards the East and the Royal Mile, one of the most famous points of interest in the city of Edinburgh. 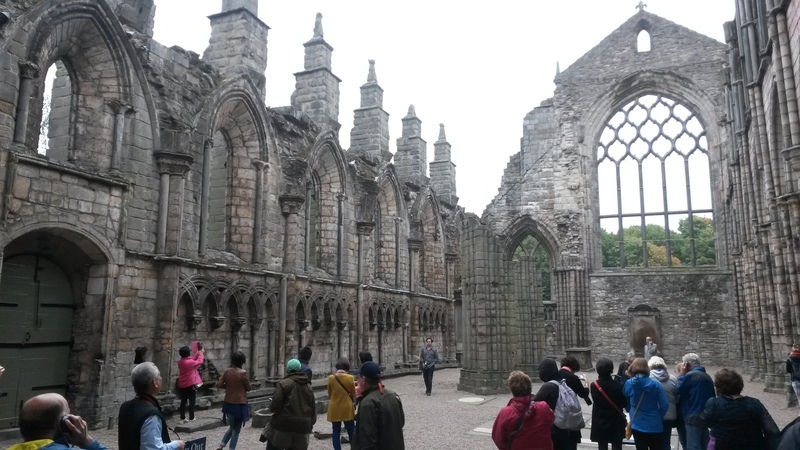 Royal Mile means the distance between Edinburgh Castle and Holyrood Palace where e.g. in old times the mayor rode for his inauguration. In those times, the palace was far outside of city borders. The Royal Mile leads steeply downward, consisting of 4 parts: The Hub (directly beneath the castle), Lawnmarket, High Street and Canongate. 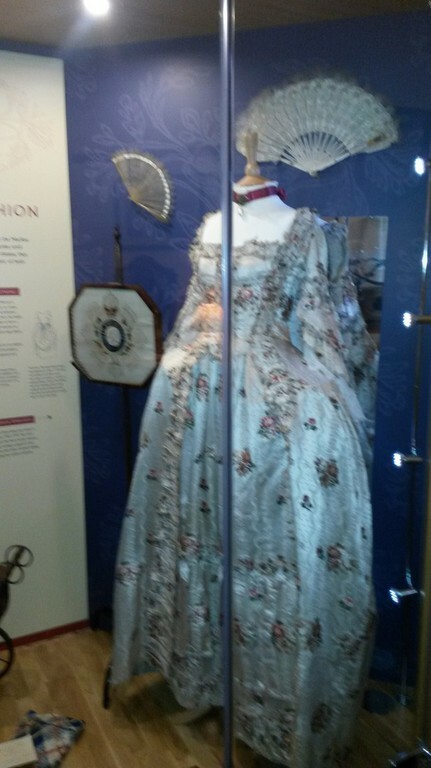 Slowly, I could imagine as Claire described it in book 2 and 3 (or wasn’t it Diana, to be real? ), one large road leading downward like the main bone of a fish over the hill crest, to its sides like fishbones hundreds of closes and wynds, in old times even more than today, mostly leading very steeply down. There were so many things to be seen, the market fountain, many historic buildings, the Cathedral, souvenir shops (of course), even Christmas shops (throughout the year! 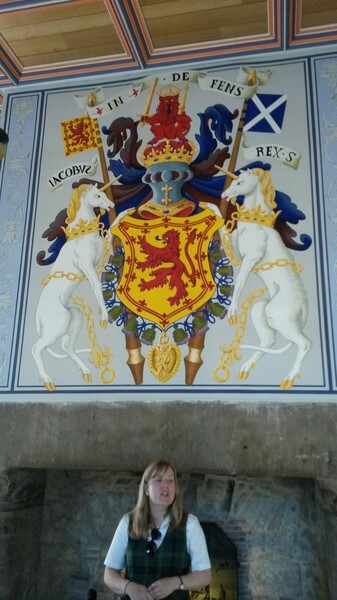 ), street artists, restaurants and pubs, museums (the Scottish Museum is very recommendable, consisting of two or three well preserved apartments, free to visit and it takes only a short time, not the whole day). Further down, there is the World’s End pub, where the old city limit was, the houses beyond are younger and more modern and close to the Palace I walked by the Scottish Parliament, an ancient building to the right with a very progressive modern building to the left. For everybody who’s more time to spend, I recommend a visit to those many lanes aside, sometimes, they’re just leading downhill, but often, they have beautiful houses and interesting spots to offer, even gardens and whoever’s interested should book one of those many tours offered, there are tours on many subjects, underground or ghost tours, even Outlander tours now. 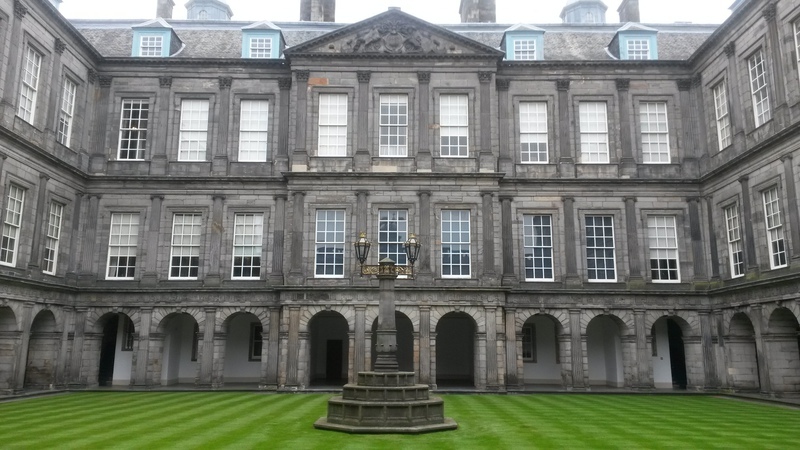 Holyrood Palace is the official residence of the Queen, when she’s in Scotland – not the Castle. Here, she will receive official visitors, e.g. the last (German) pope. 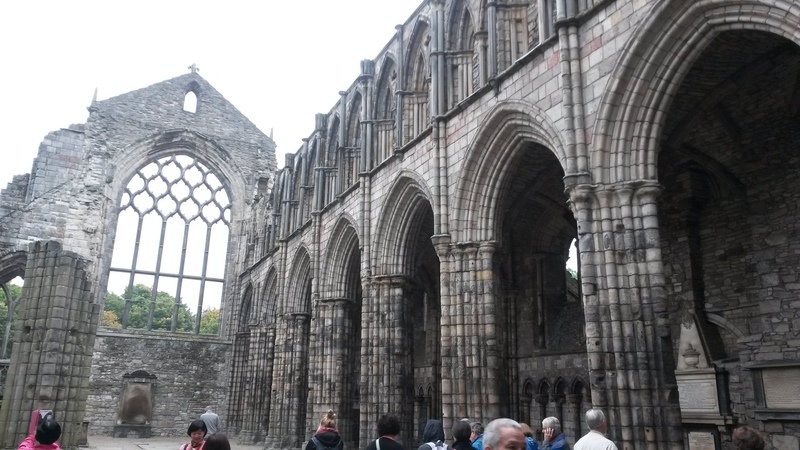 It is a huge and impressive building and we were to see only a small part of it, of course, we were not allowed to take pictures inside, so I have pics only from outside, the inner square and the ruin of the old abbey. Behind the palace, there is a big garden where visitors can walk around for hours. 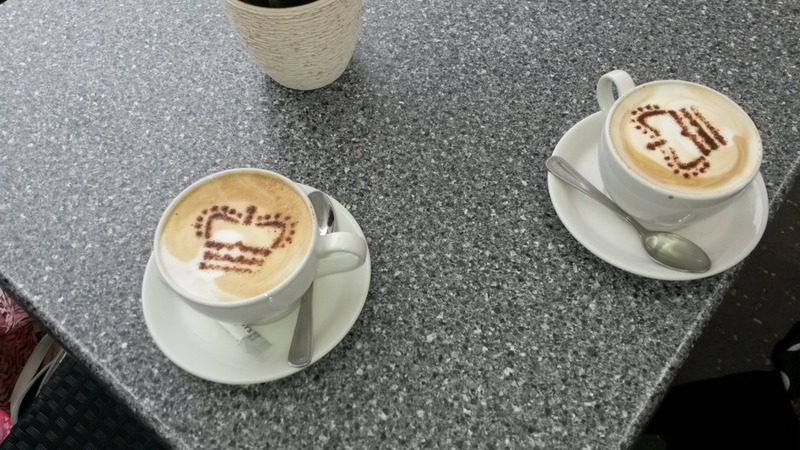 Very chic is also the cappuccino in the palace café! Going back from the palace, there was a small problem: The road to the city lead steep uphill. But, after having seen the palace as the last point of view on my list, I could take my time and went into a restaurant for a plate of pasta. There are Italian restaurants almost everywhere in the world! Not far from there, there was a sweets shop called “The Fudge House” where I bought some gifts for my family. Fudge is some Scottish equivalent for our caramel and besides that, they also had many exquisite varieties of nougat and chocolate, so I could buy a small assortment for my husband and the kids. 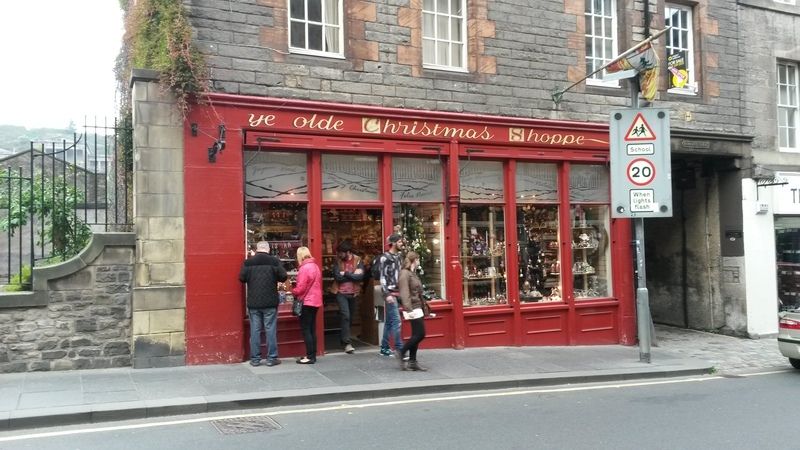 On Lawnmarket, I found a whisky shop where I hoped to find some small bottles that were allowed to be in the hand luggage in the aircraft (I had only hand luggage with me). To my astonishment, the shop didn’t have only a few small bottles, but a complete wall board with them! This enormous choice was overwhelming and I needed some consulting of the shop owner to decide what to buy for my husband. I finally bought him a small bottle of Balvenie 12 in a nice casket. Well acknowledged! Further on my way up to High Street I met a so-called city free tour which I decided to join for a while, the guide very interestingly telling about old times. I had read before on some promotion flyers about those tours, they’re mostly lead by private persons, offering a tour on a certain subject, starting at a meeting point without visitors needing to book, just who’s there in time could take part and would be allowed to pay after as much as it was worth to him. This young man was talking about torture and executions on different places in the city, a cruelly interesting subject about old prisons such as Tolbooth, superstitions and awful punishments. He led us downhill to Grassmarket where he told us about a young woman named Mary, condemned for murder of her baby, but she survived the hanging and was allowed to live as law prohibited being punished twice for the same crime and she died quite old. Here, I took my leave from this group as I just had to cross the road to my hotel. I had already checked out in the morning, but my car was still waiting for me in the hotel car park. It was about 3 p.m., my flight was to take off at around 7 and there still was some time left. So, what to do next? After changing into some clean clothes, I had an idea. 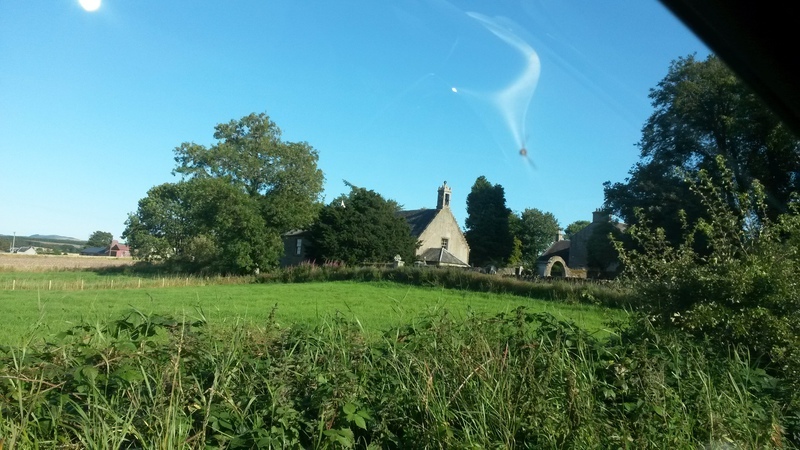 When I had tried to visit the “wedding church” the day before, I had been told “you need an appointment” and I absolutely didn’t want to drive there in vain once more, but why not try to get an appointment? I had nothing to lose and the place was in the same direction as was Edinburgh Airport, in the south and therefore no detour at all. So, why not call them and give it a try? A word and a blow and although I could hear that the lady on the phone was not enthusiastic about it when I explained my whereabouts and asked for an appointment that same day, she reluctantly offered to leave just the small gate open. Very well! It took me only about half an hour to get there, then I once more stood in the woods in front of the big garden gate and the small gate to the right was left ajar. Carefully, I opened it and got in. 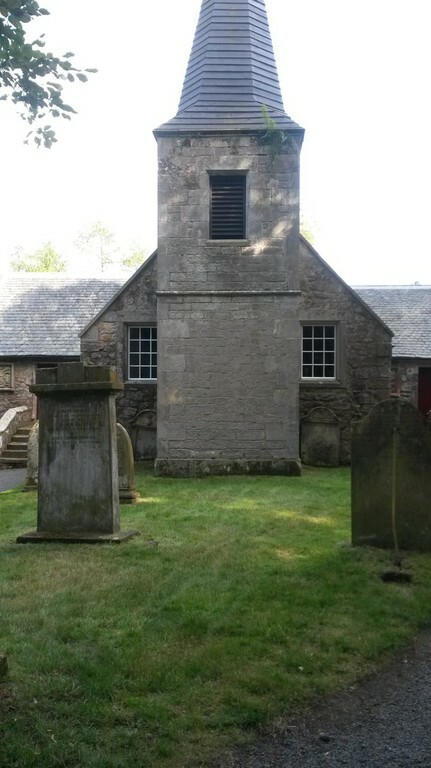 There it was, the glorious final moment of my short trip to Scotland, on the Glencorse old graveyard where they had shot the outdoor scenes for the marriage episode. A really very impressive and lovely spot! About the flight back there’s just to say that the European rules for hand luggage and liquids are being interpreted quite differently on various airports. On Karlsruhe Baden-Airport, I even had big bottles with me (that are clearly not allowed) without any problem, in Frankfurt-Hahn they were clearly denied and in Edinburgh we had to use their plastic bags, not our own ones and theirs seemed to me somewhat smaller. The man at security check was absolutely implacable and thus I had the difficult choice to leave behind either an (expensive) Tupperware box, some full bottles or a few of the newly bought refill bottles in 100 ml size because even the empty bottles had to be in that plastic bag, no matter whether they had contents or not and the bag must be fully closed. It took me a while to decide which ones to leave behind. Absolutely lame-brained. But, on the other side, I decided not to take that too serious and lose my good mood about it. After a non-spectacular flight back, I was picked up by my older daughter and back at home after about 90 minutes’ drive back from Frankfurt-Hahn Airport. In conclusion, I can say that I consider this a most impressive experience and I’m happy for everyone who may experience something similar!